Let's start with some stats here. These photos are about 15-16 months old. Tanner, the Golden Retriever is 47 pounds in this picture, and still somewhat of a puppy himself at 1-1/2. His new housemate is Oliver, a Papillon. Oliver arrived still a bit under the weather, so we waited to take pictures until he perked up. We adopted him when he arrived sick at a pet store. Lucky us; he is a great little fella. Oliver was 3.2 pounds when we brought him home. That size difference between the two pups could have spelled disaster, but we were careful about the introduction and initial days of getting acquainted. This is what I will chronicle here. 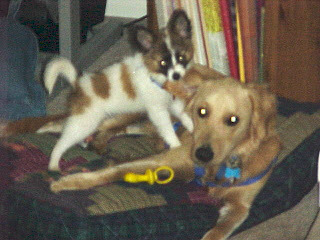 Using Cesar Millan's philosophy for bringing a new dog into your pack, I first began with a long, migrating walk. Tanner, Oliver, Xena, Toni and I all walked for about a half hour. We had to carry Oliver a good share of the way, given his still weakened condition. But I think he still got the message that he was migrating to a new place with a pack leader. While Toni held Xena, and then Tanner, I held Oliver up to sniff their behinds. Sounds a little off-color, huh? Well, that's how dogs give a friendly greeting, according to Cesar Millan. It also establishes dominance. 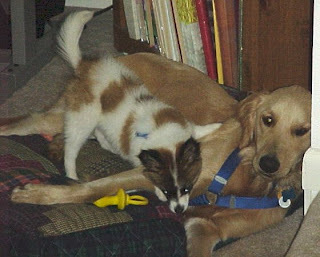 In this case, with a new puppy coming into the pack, we wanted to assure that the two older dogs did not feel dominant over the puppy. This will help to assure their gentleness and his safety. Honestly, I wasn't sure how smoothly all this would go, but I was ready with baby gates and separate rooms, if needed. We were committed to bringing this little fella home, by my daughter's agreement to take him. You know how that goes. When we arrived back at the house after our migrating walk, I made sure that all humans went inside first, establishing them as the pack leaders. I then lead Tanner to a dog bed, where I placed him in a DOWN position, and asked him to stay. Tanner is very good at STAY. 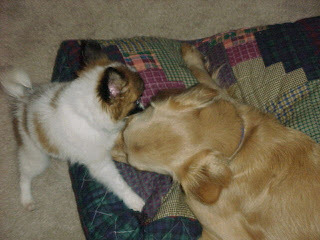 I placed Oliver near him and allowed them both to sniff and come close to each other's muzzle. When Tanner began to use a paw, I touched the paw, and said firmly, "No Paw." 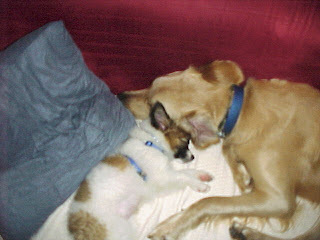 When Tanner used his snout to play, I said "Good Boy, Tanner!" He learned fast. A few minutes of snout playtime and Oliver was beat. Off to bed for him. He quickly snuggled into his crate, which we placed in an area of our family room/kitchen where he could see everyone. He slept for quite a while after that first playtime with Tanner. Similar exercises continued for a while, mostly with Tanner. He was a quick study. Xena was not terribly interested in the feisty little boy, Oliver, at first. She found his energy level to be overwhelming. No aggression...she simply chose to ignore him. At 12 1/2, she's earned the right to ignore a rambunctious child, if she likes. 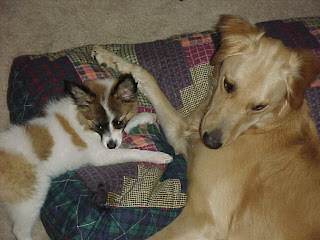 Her tolerance of Oliver has continued well, without any concerns for his safety. She is pleasant and easy going, for such a lot of mileage on her odometer. Within a few days, Tanner was Oliver's favorite playground obstacle. 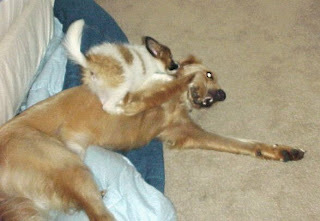 Oliver crawled all over Tanner, and enjoyed litter mate-style play like chewing on Tanner's ears and tail. Tanner didn't mind a bit. Actually, I believe he was enjoying all the attention he was getting from this new boarder. 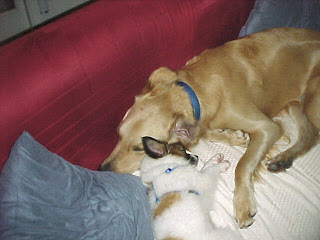 Best of all, Tanner still remembers to be gentle and careful with Oliver. Rarely does he get too rough. If anything, Oliver may abuse his privilege of being the small one occasionally, but Tanner doesn't seem to mind. They're great buddies. Teaching the boys to share their toys went smoothly also, but we'll leave that topic for another day. Just remember, all toys belong to the Pack Leader, and you'll be good to go. This Cesar Millan approach worked for me also.